A bit of a strange pub, looks like it will be quite traditional looking from the outside but the seating area on the inside is a bunch of chairs and tables that you might seen in a canteen. It twould ales on, Ruddles County and Abbot Ale, both kept in good condition and the prices seemed okay. I didnt appreciate one of the bar ladies ignoring my obvious signs that i was in need a coue more fresh pints, it was actually bordering on rude, the other bar lady was quite friendly though to be fair. There are also some interesting characters come to this pub. Called in to pass the time whilst my wife was shopping nearby. Not a bad pint of Directors and not too OTT pricewise (£3.23 if I remember correctly) Spitfire was also available. But I was NOT impressed at having to stand for most of the time because more than half the tables are strictly reserved for diners only. This really p**sed me off because in the middle of the afternoon, nobody was eating, but the numerous drinkers were all herded together like sheep. This is a pub, not a restaurant. Trying to be both in such a confined space is not an option. It had been ages since my last visit to this place and I don't think that I'll be in much of a hurry to return. I can't remember the exact name of the so called real ale they poured me but I think it is the first time that I have been unable finish a pint in Liverpool. Like on this occasion the only reason I'll return is if I'm desperate to go to the lav. I hadn't been in here for at least 15 years until my return this Saturday. 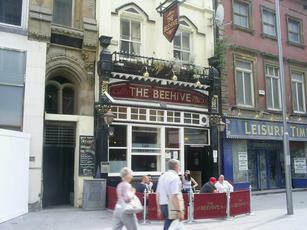 I always remembered this as one of the city's more traditional pubs back then. Nowadays, it's situated right next to the new Liverpool One shopping centre and appears to get very busy at times. The front area retains some original character with carpets, bookcases and pictures of Liverpool and the pub itself in its former incarnation as the Walkers Grill. The bar area itself gets packed, whilst beyond the rear has been opened up into a restaurant. I'm afraid this has taken away from the pub a little of its character. 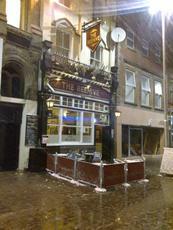 3 real ales were on - Banks's Bitter, Black Sheep Best & Shepherd Neame Spitfire. Pretty much a bog standard pub these days. Oldish small pub which now finds itself in the middle of a new shopping area. Had a decent pint of Hardy & Hanson's Rocking Rudolph. What spoils this place is the creation of an open plan kitchen and "restaurant" area towards the rear of it which makes the place look and feel like a snack bar rather than a pub.